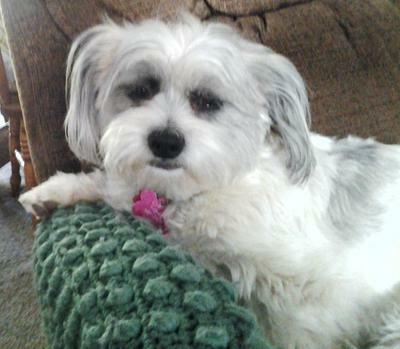 Three years ago we adopted Molly, a Shih Tzu-Bichon Frise from the Klamath Falls No Kill shelter. She was a transfer from a no kill shelter in Lancaster CA at 9 months old. The first time we saw her we instantly fell in love with her. After three visits and lots of interaction we brought Molly home. She just loved our cat Miss Kitty right away.The first 2 weeks we tried house potty training to no avail until our daughter, her Aussie & poodle came to visit for the weekend. Molly watched them go to door, bark to go out and of course Molly followed them out to watch them potty. By the end of weekend she was potty trained. Molly is very social and wants to be friends with all dogs & cats and of course people. She has a wonderful and loving disposition. Three months later we adopted a 1-year old Mini Aussie named Annabelle. All 3 animals have bonded wonderfully. Miss Kitty & Annabelle keep Molly's eyes & ears cleaned by licking..Quite cute to watch. Molly has become quite the hunter as we live on 5 acres & there's plenty for her to hunt. We get tons of snow in the winter and both dogs love playing in it even with their snow jackets on. She loves going to the groomers & baths.